Stewart R: Hmmmm, seems it really is a time to not judge a (comic) book by its cover as, having cancelled the controversial Milo Manara variant to Spider-Woman #1, I have to say that the standard issue cover from Greg Land and Morry Hollowell is pretty darn uninspiring! I'm sure, however, that Dennis Hopeless's writing and Land's improving interior art is going to do this new series some proper justice and give us the Jessica Drew book that we, as Marvel readers, deserve. 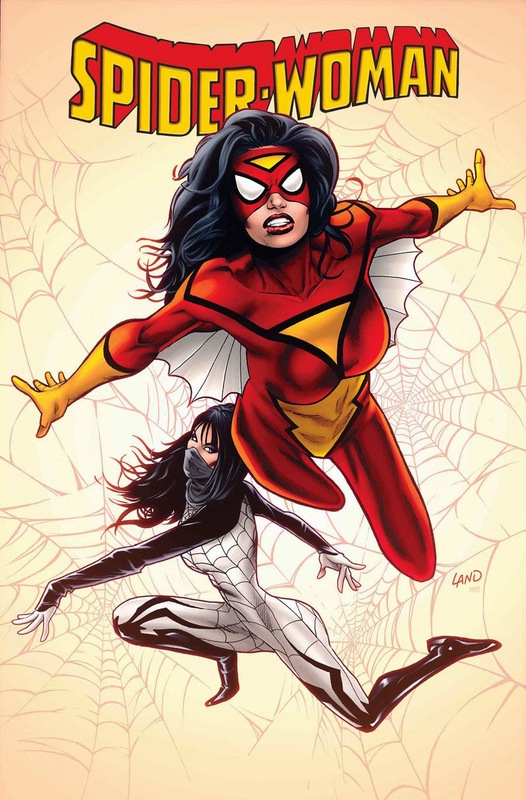 The 'dive in' point, as 'Spider-Verse' gets under way, isn't a bad place to kick-off at all, giving a genuine focus to the book, Hopeless an infinite number of dimensions to play in, and Jessica someone to bounce off of in the form of newly discovered Spider-person, Silk. I'm really hoping that some of the deep insight into Jessica's personality that Bendis started to explore in his iteration gets some place in this new book as she's got one hell of a turbulent history and interesting outlook as something of a victimised hero. There's so little wiggle room in there currently and the publishers' axe hanging over the likes of X-Force and (*sob*) Elektra just makes me want to stick with them until the impending end. Matt C: After some sparse weeks for my pull-list, Marvel return with a vengeance on Wednesday with the majority of the titles I'm getting coming from the House of Ideas. 'Time Runs Out' continues with both Avengers #38 and New Avengers #26, while three of Marvel's best books - Moon Knight, Daredevil and Magneto - also make a welcome appearance, and Avengers & X-Men: AXIS rounds things off, with me still willing it to improve dramatically (and were there signs that was a remote possibility in last week's issue?). And then there's Avengers World, a title which I said I was dropping with the last issue only to find myself drawn to what appears to be a tale of Doctor Doom and Valeria Richards putting together an Avengers team. I just may not be able to resist that one! Over at Image Deadly Class #9 is my number one choice, and the more I ruminate on the many qualities of that title, the more I'm convinced it's entering a league of it's own.